Welcome! I am researcher, engineer, and designer working at Google Orange County, where I engineer the UI and UX evolution of systems that monitor planet-scale apps and websites. Our systems track mission-critical metrics and trends and provide high performance data visualization and deep data analysis tools for analysts and leadership. Previously, I was a part of eBay's Human Interface Group (HIG), where I helped envision, design and implement novel, intelligent, and beautiful interfaces, user experiences, and design standards for both online and offline commerce, driven by rapid iteration and real-world experimentation with bleeding edge hardware and software technology. My primary research interests include human-computer interface design (UX), real-time data visualization and management, intelligent interfaces, and real-time interaction with rendering algorithms. Some of my recent industry work has involved researching, designing, and implementing high-fidelity, full-stack prototypes for eBay, as part of their Human Interface Group (HIG), an expansion of the former Exploratory Prototyping Innovation Center (EPIC Design Lab). In addition to rapidly iterating on both short term tactical and long-term strategic prototypes, we also explore, catalog, document, iterate on, and formalize eBay's broad multi-screen visual design and UX standards across all platforms and properties, providing both design and engineering guidance in pursuit of a consistent design language across the company. 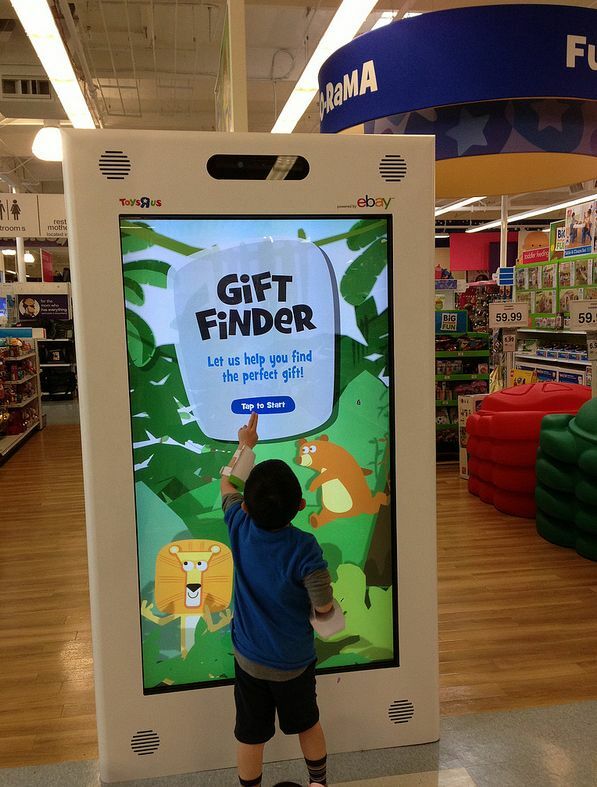 Toys R Us Digital Wall, eBay's first venture into the world of digital retail experiences. Here we designed and developed a massive 70 inch touchscreen kiosk placed in the Redwood City Toys R Us store for over a year of continuous experimentation into this new kind of platform. Kate Spade Saturday Shoppable Windows, a project where we took four empty storefronts, and filled them all with amazing product displays and interactive storefront kiosks that let people all over the streets of New York City fluidly browse through a beautiful set of brand new products right on the storefront window, transfer it to their phone and receive a personalized same-day courier delivery. Westfield Connected Glass, a three-vendor mall-based installation that represented the first steps by eBay to transform these connected retail experiences from an experimental blend of online and offline commerce technology into a truly scalable and streamlined customer-focused business model. eBay Now Kiosk Prototype, a prototype exploration into the possibilities that emerge when you blend the power of fast local delivery and cutting-edge connected, digital retail experiences. eBay Marketplaces Visualization Kiosk, a beautiful and powerful internal project to explore the data that drives the largest marketplace in the world. My primary academic research interests have been human-computer interface design, tools for authoring of generative interactive stories, interactive data visualization and management, plan-based interactive dramas, and real-time interaction with rendering algorithms. During my time as a PhD candidate at UCSC's Expressive Intelligence Studio, my dissertation work explored the design and development of intelligent and graphical interfaces that allowed non-technical authors (writers and game designers) to create compelling interactive stories using relatively complex story generation algorithms. Because creating interactive and generative stories is akin to “programming” the structure of a narrative, which can be a daunting task for a writer, there has been and continues to be much work in making the process of creating these types of stories easier and more approachable for those without programming experience. I worked on designing and developing AI-driven virtual avatars targeting the concept of Supporting Character Realism, in which virtual characters act and interact in a convincing, consistent, and human-like manner in order blend into the background activity of a virtual world. This work is inspired by hybrid controller scenarios where humans work with in tandem AI systems, trading off control of avatars interacting with human trainees in virtual environments. Story Canvas, a comic/storyboard-based interactive, generative story authoring interface based on the same underlying story model of Wide Ruled. This research focuses on developing and evaluating completely visual authoring techniques and smart interface features for the underlying plan-based story generator. It builds off of the lessons learned from Wide Ruled, and sets the stage for a more complex story model in future work. As part of my work, I also explored the future of Story Canvas research, with a collection of concepts, illustrations, and process descriptions that overview the potential evolution of this plan-driven story authoring architecture. Wide Ruled, an interactive story authoring and generation application based on the Universe story generation model. This project focuses on providing a simple and usable interface to the complex and powerful underlying generation model, that can be utilized by authors with little or no computer programming experience. Transient Rendering, a formal model of light transport, taking into account a non-infinite speed of light. In this work, my colleague Adam Smith and I introduce a physically-relevant generalization of the rendering equation and a method for approximating this equation, and define a summary measure of transient light patterns, which is used as a basis for a general sensor model. Facial Type, Expression, and Viseme Generation, a method of generating new and arbitrary face shapes from a sparse set of initial real-world data. This work focuses on attaching concrete, human-readable parameters to abstract geometric variation in face meshes. Interactive Thin Shells, an interface for the analysis of physically-based animations. This project, my Master's thesis at Cal Poly, San Luis Obispo, focused developing a novel way of interacting with physically-based animation algorithms, that allows for free-form and real-time experimentation and modification of all relevant local and global simulation parameters. A High Population, Fault Tolerant Parallel Raytracer, a project and resulting paper focusing on the design of a distributed raytracer that exhibits a fault-tolerant and dynamically-scalable three-tier architecture.